The second month of full operations completed on 14th April. During a quiet period across the cryptocurrency ecosystem, active users grew by 21.2% with a total trading volume of 2.3 billion USD equivalent across the period. This monthly report breaks down trading revenues, volume and user growth and will continue to provide more detailed statistics each period to our community of users and to the Nectar token holders. 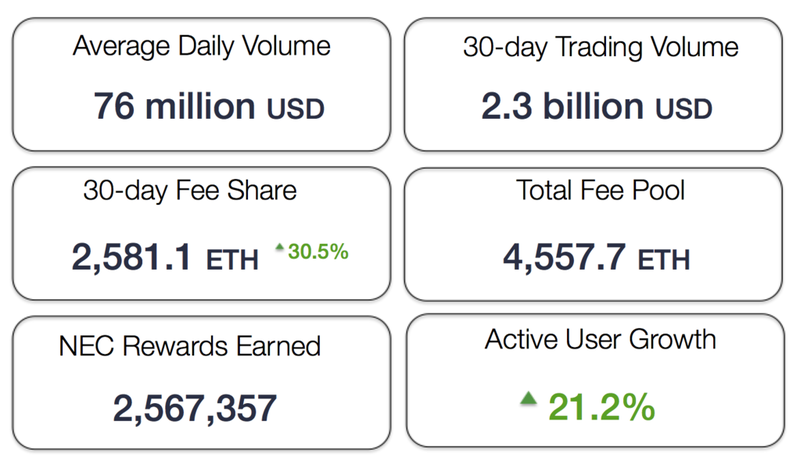 Total fees of ~$2,650,000 (depending on price feeds) were collected through trading in the 30-day period. In line with this, 2,581.10 ETH have been contributed to the Nectar token contract, pledged to holders of NEC. 2,567,357 NEC tokens were issued to reward Market Makers who were active in the month. Statistics can now be viewed at the nectar community website and dApp. The credit of new tokens happened directly to trader’s Ethfinex accounts on the 14th April. The minimum equity requirement to activate an account was reduced to 1k USD equivalent, making the platform much more accessible to new customers. This reflects the Ethfinex support team reaching maturity. 12 new tokens were listed on Ethfinex, including DAI, AION & REQ.The fee schedule and market maker loyalty reward issuance were made even more competitive to attract new customers. Launch of the Nectar.community dApp for early governance and statistics.Refinement of the non-custodial APIs and preparation for further integration testing, alongside development of improved UX and user on-boarding for the decentralised trading portal. A look at the previous month’s key developments. With an aim to provide as much transparency as possible to token holders, Ethfinex will provide detailed reports showing the results of each 30-day period. Fee currencies in the table are ranked in order of most collected. 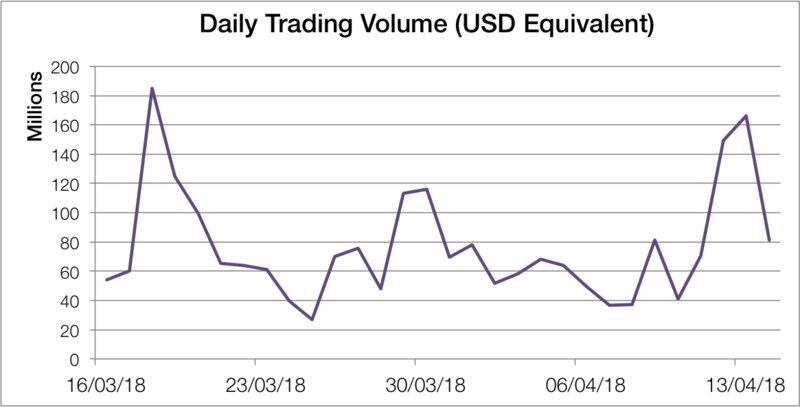 Note - fees cannot be extrapolated directly to trading volume as users can set their preferred fee currency (hence the popularity of USDT and BTC). The above chart shows 50% of trading fees in all currencies collected. 2581.10 ETH was collected during the month and pledged to NEC token holders. BFT (BnkToTheFutureToken) and DAI (Dai Stablecoin) were the best performers out of the 12 new additions in terms of fee revenue. The total 30-day trading volume was 2.306 billion USD equivalent — which was a fantastic result for the second month. 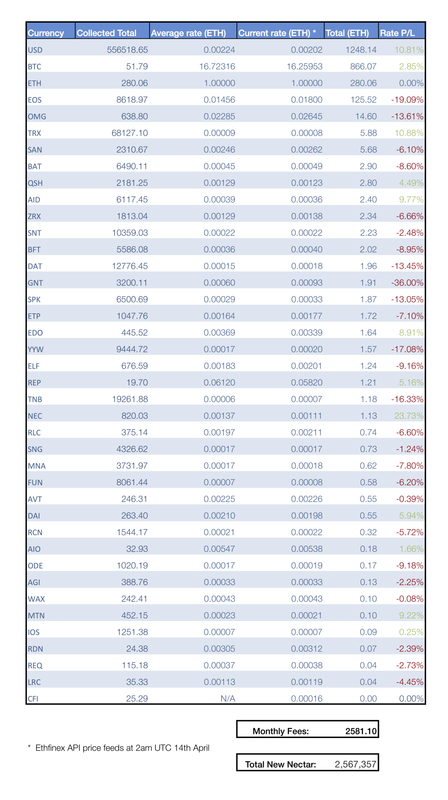 Peak daily trading volume was 180 million USD, with an average of 76 million USD. The majority of the volume resulted from the ETH/USD pair. User votingThe Ethfinex proposal and voting decentralised application is live. You can submit a proposal today, and several will be selected during the month for Nectar token holders to vote on. The initial proposals selected will likely have 30–45 day voting periods to give the maximum number of individuals time to cast their vote. Some of the early proposals received discuss airdrops, referral schemes, and token listings. Our decentralised trading portal will allow for non-custodial, Ethereum-based trading via MetaMask and Ledger. This portal is currently going through integration and final style changes to simplify user experience, but is set for launch shortly. The Ethfinex gateway API will allow users to submit orders in the 0x format, subsequently allowing anyone to create their own UI (e.g. a ShapeShift style interface) to interact with the Ethfinex order books. All this can be done without creating an account, depositing funds or trusting Ethfinex. Token listings will now progress on a steady schedule, aiming to list batches of new tokens every other week. If you think there is a particular token we should support, don’t hesitate to share your thoughts on Reddit or Telegram, or reach out via our Token Listing form to have it added to the Ethfinex discussion forum.